A Canadair Challenger 601 corporate jet, registered N115WF, was destroyed in a landing accident at Aspen-Pitkin County Airport, CO (ASE). The copilot was fatally injured; the captain and the passenger received serious injuries. The flight originated from the Tucson International Airport (TUS), Arizona, at 10:04 and was bound for Aspen. The departure and en route portions of the flight were uneventful. As the flight neared its destination, a high-altitude, terrain-limited airport, air traffic control (ATC) provided vectors to the localizer/distance measuring equipment (LOC/DME)-E approach to runway 15. About 12:10, the local controller informed the flight crew that the wind was from 290º at 19 knots (kts) with gusts to 25 kts. About 12:11, the flight crew reported that they were executing a missed approach and then requested vectors for a second approach. ATC vectored the airplane for a second LOC/DME-E approach to runway 15. About 12:21, the local controller informed the flight crew that the wind was from 330° at 16 kts and the 1-minute average wind was from 320° at 14 kts gusting to 25 kts. The initial part of the airplane's second approach was as-expected for descent angle, flap setting, and spoilers. During the final minute of flight, the engines were advanced and retarded five times, and the airplane's airspeed varied between 135 kts and 150 kts. The final portion of the approach to the runway was not consistent with a stabilized approach. The airplane stayed nose down during its final descent and initial contact with the runway. The vertical acceleration and pitch parameters were consistent with the airplane pitch oscillating above the runway for a number of seconds before a hard runway contact, a gain in altitude, and a final impact into the runway at about 6 g.
The weather at the time of the accident was near or in exceedance of the airplane's maximum tailwind and crosswind components for landing, as published in the airplane flight manual. Given the location of the airplane over the runway when the approach became unstabilized and terrain limitations of Aspen, performance calculations were completed to determine if the airplane could successfully perform a go-around. Assuming the crew had control of the airplane, and that the engines were advanced to the appropriate climb setting, anti-ice was off, and tailwinds were less than a sustained 25 kts, the airplane had the capability to complete a go-around, clearing the local obstacles along that path. Both flight crewmembers had recently completed simulator training for a type rating in the CL-600 airplane. The captain reported that he had a total of 12 to 14 hours of total flight time in the airplane type, including the time he trained in the simulator. The copilot would have had close to the same hours as the captain given that they attended flight training together. Neither flight crew member would have met the minimum flight time requirement of 25 hours to act as pilot-in-command under Part 135. The accident flight was conducted under Part 91, and therefore, the 25 hours requirement did not apply to this portion of their trip. Nevertheless, the additional flight time would have increased the crew's familiarity with the airplane and its limitation and likely improved their decision-making during the unstabilized approach. PROBABLE CAUSE: "The flight crew's failure to maintain airplane control during landing following an unstabilized approach. 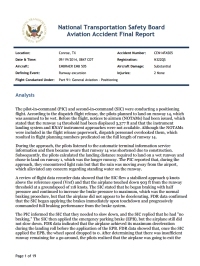 Contributing to the accident were the flight crew's decision to land with a tailwind above the airplane's operating limitations and their failure not to conduct a go-around when the approach became unstabilized." Wind 310 degrees at 9 knots, gusting to 28 knots; wind variable between 270 and 360 degrees; Visibility: 9 miles in haze; few clouds at 3500 feet AGL, broken clouds at 4600 feet AGL, overcast cloud deck at 5000 feet AGL; Temperature: -11°C, Dew point -20°C; pressure 30.07 inches Hg. Video from Aspen airport infrared cameras of Jan. 5, 2014 jet crash from Aspen Journalism on Vimeo. Distance from Tucson International Airport, AZ to Aspen Airport, CO as the crow flies is 866 km (541 miles).